History as a subject and a discipline is important in every social milieu, it determines people’s oriented perception, way of thinking and narrative description of past events in return shapes how to handle future occurrences. Nigeria as a British experiment fought tooth and nail to obliterate Biafra from the face of the earth to the extent of removing Biafra from Africa map to enable them continue unabated occupancy of Biafra territories, extraction of oil at their own expense, marginalization of Biafrans and denial of Biafra identity. History is not grandly thought in schools both in secondary and tertiary institutions rather preamble to discourage Biafrans to have full knowledge of their history and war crime perpetrated against them. 1914 Amalgamation of Southern and Northern protectorates by Fedrick Lugard was for their own economic interest, he said the experiment was like oil and water that cannot be mix whereas, blind folded myopic Nigarians are now shouting restructuring without comprehensive knowledge of their baseless hallucination. Since the forceful creation of the contraption called Nigeria, unity in diversity never worked. The modern day genocidist Yakubu Gowon said “there is no basis for Nigeria unity”. Today seeing poor history students come up with the idea of restructuring is either they are far from reality or incapacitated to be a rational creature. Northern elites are the major problem of Nigerian political shenanigan, Aburi Accord agreement held in Ghana was flouted by then Military Head of State Yakubu Gowon, to enable each region manage its resources with the agreeable tax contribution to the centre. Northern hegemony rejected that which was agreed at the conference, they started killing thousands of Biafrans which left Dim Odimegwu Ojukwu no other option than to declare sovereign State of Biafra. 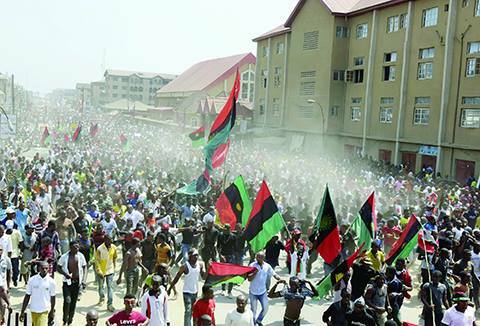 One might ask why it is now Nigerians are gallivanting after killing millions of Biafrans in the same name of unworkable restructuring; are they losing sleep over Biafra? Now it is in everybody’s lip. No doubt, restructuring simply means status quo remains the same; Biafra boundary adjustment, inhuman degradation, marginalization, killing of innocent Biafrans, denial of Biafra identity and total second sphere of submission of Biafra to Nigeria Islamic caliphate. Should one subscribe for or induces Nigeria restructuring, it means the dead of millions of Biafrans are in vain and their souls will never rest in peace as one of the victims at Donald Trump solidarity rally charged Biafrans before passing away “get Biafra for me my soul will rest in peace”. Till date the agony is still fresh in the heart of Biafrans thinking otherwise is nothing but going back to the doom. Nigeria deception tendency never yields anything good, from 3 regions in 1960-1963, to 4 regions; then 12 States in 1976 and now 36 states yet, nothing to show for. Nigeria as an expired British experiment has no political remedy the way expired products are prohibited for human consumption. For a geographical entity to live as a free people, collective interest must be respected as Britons voice was heard to opt out from European Union, Biafra referendum only means to text their resolve while intra economic relations can still be permissible for regional interest. To return tranquity, peace and serene atmosphere, dissolution of Nigeria is the best option because force marriage always ends up in disaster as the contraption called Nigeria has no peace now.